He sat in the comfiest chair, his spectacles resting with supernatural force on the tip of his nose. Looking at his worn notebook that he always had with him; he skimmed the page, ably listening to one of the monthly tenants of the Full Circle Film Group as they babbled on about “why don’t they release good family films anymore” before righting our course back to the latest films. Or some other movie released around that time. It didn’t matter. To me, an eighth-grader with a depressive movie obsession, John Pickard was a celebrity of sorts, back when a local writer could be that—and he wanted my opinion on the latest in cinema, or at least as far as the Penn Square Mall General Cinema could take me. But Pickard sure got it. With his stoic glare, he never treated me like the annoying kid, as so many others around that time did. He was one of the few people that talked to me like an adult, mostly listening to my idiotic ramblings and offering unsolicited but, in retrospect, much needed advice on navigating through life while being surrounded by people who will probably never understand you. A lot of people would complain about him to me; either he was too short or too dismissive with them. There was a key to understanding the man, and I feel I was lucky enough to. And whether it was reading my film reviews before I sent them in to the school paper or, running an article in the Gazette about my attempts at publishing, or a few times, letting me come teach his UCO night class about foreign horror flicks like The Bride With the White Hair or Suspiria, I don’t know if he knew it, but he was always a much-needed mentor at the time. Sadly, we lost touch a couple of years ago. He was never at screenings anymore, the Gazette unceremoniously dumped him and I think even UCO moved on without him. I eventually moved to Colorado for a while and, when talking to an old friend, mentioned that he “thought” Pickard died—but wasn’t sure. But, reading this obituary, I’m pretty sure now. 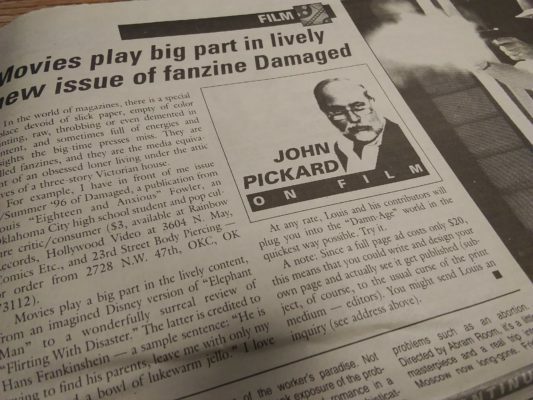 John Pickard was probably the best film critic Oklahoma City ever knew—or didn’t know—a book-heavy knowledgeable sort that ruled the printed page in a time before fandoms prevailed and rewritten press releases were the norm. He taught me the painful difference between a much-loved entertainment reporter and a usually derided film journalist. Sure, looking around, there’s not much credence in all that anymore, but for that formative time in my youth, thank God he reigned when he did. Fade to black. For those interested, an open wake will be this Saturday, Jan. 26, 4-6 p.m. at “The Other Room” at Picasso on Paseo, 3009 Paseo. Previous post Oklahoma is number two… in Hepatitis! From the 7th grade through beyond high school graduation, I was fortunate enough to be taught and influenced by some of the last pre-Internet journalists/writers because of the Newspapers in Education program. It was a time of dark rooms, wax and roller page building, and huge presses housed inside the local newspaper offices. I am so thankful and grateful that I was able to savor those building blocks at the cusp of change. Thanks, Louis. He was must-reading back when the Gazette actually had must-reading. Thanks Louis. He was an Oklahoma Icon critic and a genius kind of person. He is missed. I was a new professor in his department and he was a colleague for a year or two before he retired. He came off as a curmudgeon, but I soon realized that he was actually a nice man with a wicked sense of humor. I liked him immensely. I’m glad he left a legacy of film journalism and talented students. A very special and brilliant man and mind. I worked with John at UCO, occasionally read his column in the Gazette. I wasn’t much of a movie person, liked average movies, but he would discuss those with me and give observations that were amazing to me. I told him if he ever wanted to write a book I would put it in the computer. He did, I did, and somewhere it is printed out. He picked it all up and paid me an agreed upon amount. I didn’t want the money, I believed in him as a movie man and wanted him to write it. I was amazed at what he wrote and depth of knowledge he had. He came to see me one last time about 8 years ago and he looked great and happy. I was delighted to see him. I always called him the lovable curmudgeon. He looked at me over his glasses and chuckled. He will be missed. A great guy! He was always interested in my paintings, and always had very astute comments. An encyclopedic knowledge of film, sadly i was too young to really appreciate how extensive. An insightfull mentor…great laugh too. OKC has lost a great one.